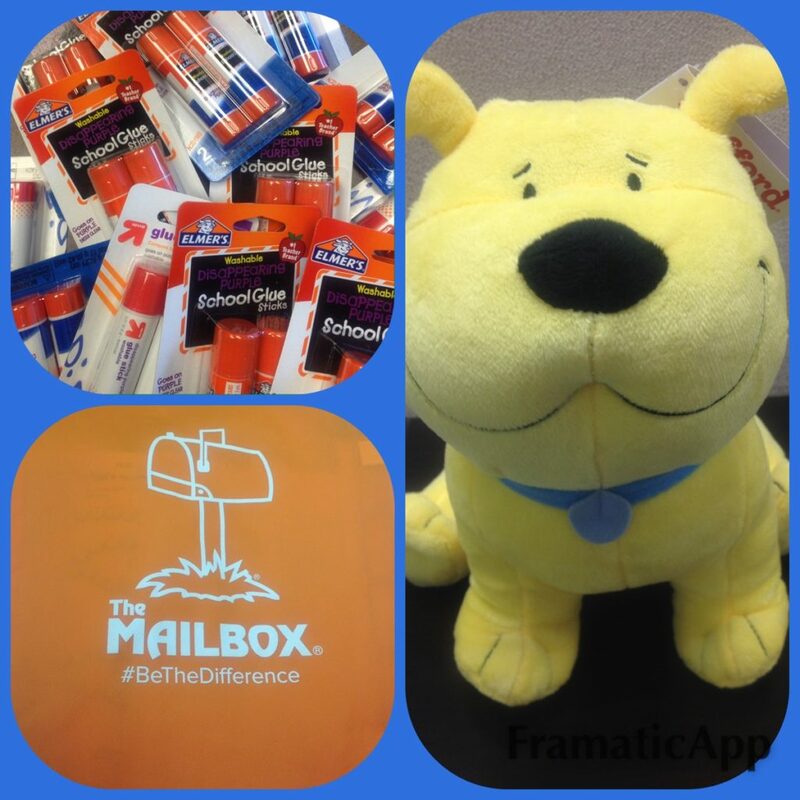 What do 30 glue sticks, an adorable stuffed toy bulldog named T-Bone (that is longing to become a class mascot! ), and a bright orange Mailbox bag have in common? You guessed it! They are mine—but not for long! They’ll soon be on their way to the winner of this month’s First Friday giveaway. To enter to win this prize pack, simply leave a comment right here on the blog telling us when students return to school in your school district. Don’t delay! The deadline for entry is midnight, Sunday, August 14. Congratulations to Deena B., the winner of this month’s First Friday Giveaway! Students return September 6th in our school district. Monday, September 12th is our first day of preschool. Student first day is August 17th! Welcoming our students back on August 29! Our students return Sept. 6th. In Orange County (Orlando), we start back with students tomorrow – August 15th! Our kids start September 1! I am looking forward to school starting September 12! Students go back to school August 17th in our district. We start school on Sept. 6; the first day is a half day. Our students return on August 22! We begin on August 29!! Wildwoods Pre-School, in Overland Park, Kansas Starts September 6. Our students return on Wednesday, August 24th. My students return Wedneday August 10th!! The school’s in my district start school on August 23rd. We start back on August 29th with a half day. School begins for our school on August 29th!! Our students come back August 9. Students return Aug. 10, in Belen, New Mexico. ..am I ready?!?? NO..YIKES!!! Students return in Pauls Valley, OK on Thursday, Aug 11th. August 31 for grades 1-5 and September 6 for my kinders! Students return on September 1. Students at Sandyston-Walpack School in Layton, NJ happily return to school on September 6th! I can’t wait for a new year! Students return to school on September 6th!! We start school on August 24. We start August 29th. Meet the teachers is the 25th! I don’t want summer to end just yet! August 22nd for my kids but the two year old class I teach doesn’t start until after Labor Day! They would love a class mascot! Student phase-in on August 29th and first day of school is August 30th! This year we are trying a brand new kindergarten open house day, so incoming kindergarten students will have the chance to step through the doors on 8/31. School officially begins with all students on 9/7. Our students start August 22nd. Children return on August 22nd, teachers begin on August 15th. Teachers start AUg. 15 and kids on the 17th- half day. My students start Wednesday, September 7th. ? Kids first day back is August 29. I go back August 15. September 6th: a full day of tears and cheers! Our students return August 22! August 18th in Centralia, MO! September 8th. New York City schools ?? August 15th. I love the adorable dog. It would become our class mascot. Sooooooo cute! Teachers start back August 17th and students return August 22nd. Our first day of school with students is August 30. The teachers start August 15 and the students start August 23. Our students start August 29th! This Monday!!!! I’m ready to go!! Sept 19 is the first full day! Our first day back is September 6th!!!!! So, excited…. We go back starting 8/31 here in Warrington, PA ? The district I live in…September 7th. My students…September 8th. I start August 22nd and my students start August 24th! Students return September 6th. Can’t wait! Our students begin on Tuesday, September 6th. We start on Aug 11th here in Oklahoma. First day jitters for both children and teacher. I always have a welcome back party. We start on September 1st! September 6th is the kiddos first day! My students will return on August 22nd, 2016!! The sweet, energetic blessings will be here on August 15th! School starts here August 10th. Our students returned yesterday, August 4th. Our students start back Aug 22! Teachers go August 22 and kiddo’s come on the 24th! Students return Tuesday September 6th! Our students return August 15th. Students return on August 15th. Our kids start August 23rd. We start school on August 10th. Students return to school on Tuesday, September 6th! Students in my district of Jersey City come back on Thursday, September 8th . New students August 17, all others August 18. The school I work the first day is August 15. Public schools will start on August 29. August 24- can’t wait to meet my new kiddos!! August 24. Can’t wait to meet the kiddos! Teachers report on August 22. The first day with my kids is August 24. Our students start back on August 29th. Yesterday was our first day! August 4th! K-12 students come back August 23, but my preschoolers start a week later (29). Our kids go back August 18th-we teachers start August 15th. Can’t wait! Our district returns on Monday, August 22nd. However, teachers return Thursday, August 11th for inservice meetings … and many of us are already at the school setting up our classrooms! Quick, fun summer … now on to BACK TO SCHOOL FUN! LOVE T-Bone … from Clifford, right? Thanks so much! Our kids return August 29th!!!!! We start on Monday, August 22nd. Also our district passed a bond in the spring and are currently implementing some awesome new technology I our very old school building..(woooo) but that means our classrooms are still under construction, we can’t get in until Friday the 12th, it’s killing me!! Kids return to school August 22! August 31 for the students! Our students return to school on August 22nd. Students start school on August 9. Students begin on September 7th this year! Teachers, Aug. 23. Students, Aug. 24! Our students report back on August 29th. Students come back August 29th! Can’t wait! The students will be returning to school August 18th. Students going to school in the Fort Smith Public School District in Fort Smith, Arkansas start school on Monday, August 15th. August 8!!! I’m so excited to get started with my new kiddos! Teacher work days start Aug 26- kids start up on Sept 1? August 25! Two weeks later than normal! Our first day is September 6th. We moved two campuses this summer to a brand new building to become ONE! Childcare all the way up to high school. Very exciting and scary all in the same!! The kids start on Thursday August 25th. Students start on September 6th. August 15 for staff and September 6 for students. September 6th for elementary students, 7th graders and freshmen. The following day for 8th grade, sophomores, juniors and seniors. I teach Pre-k and our kids start on September 6th! Students begin on August 17th. August 29 th for me and August 25 th for my son. Crazy! Enjoy what’s left! Students start back September 6. August 9 is our first day of school. Our students return on August 18th. Our first day of school is August 29th. Students arrive August 16th!!! ? August 22 is our back to school date. August 22nd! I’m so ready to get back to the students! We start school on Tuesday September 6! August 16th! Can’t wait to meet the new kids! Our kiddos start Aug. 24th! We return to school on September 6th. We start schoo,September 8. I can’t wait. Teachers report on August 18th. Students arrive on August 23rd. We start on Sept. 6th! Enjoying every last drop of summer until then! August 11th…and were so ready! Our students start on August 29th. August 22….I’m busy preparing for my new kids!! Students begin Monday, August 22. We get students Aug. 11! the district starts on Sept 6 but lucky me preschool starts on Sept 7. We start September 6, the first week is staggered entry with small groups and a shortened time. I’m back August 23 to get things set up and meetings . Monday, August 22, 2016!! It’s going to be an awesome year! Woohooo!!!!!!! Teachers return August 15 and students return the 18th! August 15th for staff and August 17th for students. I teach in Egypt in a British School. We go back to school on August 21st. Chicago Public Schools students don’t start till after Labor Day September 6,2016! ? August 10th for Staff, August 17th for Students! Students go back August 22! First day of FUN is August 15th! Staff starts back August 12th and students return on August 22nd. Our students return on August 29th. My class goes back September 6th! Our student first day is August 29th. The district starts Sept. 6th…. Kinder interviews are that first week, so kinders don’t technically start until Sept. 12th. We get started on the 17th and our kids are there on Aug. 19th. Here we go! The kids return on August 16th. Of course us teachers are working as we speak! Ours return August 22, too. September 6 is the first day. Our kids in Katy, TX return August 22. We start back September 6!! Teachers on August 15. Students August 16. Our students don’t start until Tuesday, September 6. Teachers start August 11 and kids come August 17! We’re starting with students on August 22. ? Classes begin on Sept. 6th! I am starting a new school. It will be built and will begin October 24th. It’s for special needs. I think I beat you all! I’m at a year around school. We started July 26th. Jealous? Our lovely students return back to school August 29th. August 15th is the kiddos first day back! Students come August 24th. Teachers are already there ? Students start on August 22. Students begin school on August 22! School starts on August 24th!! August 22 is the big day…back to school for LISD students! My lovely littles return Wednesday, September 7th. We start school August 15th. We start our best year ever on August 25th. Students start on August 29th, with a few staggered days during that week. Our students start on Auguest 29! Teachers start the 11th and students start August 15th!!! Excited!!! Students return on Monday, August 29! We start on September 8th! September 6th ….and I’m sure all my little students with autism would luv a new little friend to cuddle with! ? My students begin August 22nd! Teachers go back September 6th, students return the 7th. Teachers start on August 25th, students start on August 30th. Looking forward to another great year! We start school Sept 1st! My munchkins start September 6th but the rest of the country starts August 15th. We start the 6th and it’s a half day! My littles start September 6th! Students will return on August 22nd. August 15th! Super soon! They would love this pup! Students start on August 10. Students start August 22nd! I’m getting excited ? Students start back August 10th. Students start Sept. 6! Would love to win this for my 2nd graders!! We start school on August 17th. We start school September 6th! Can’t wait! The kids start school on September 6th in our public school district. Students return Thursday, September 8th. Students come back on August 18th! We start on Thursday, August 18. Love mailbox and students love gluing things! August 10th,2016 ready or not here they come. They begin the new school year on Sept 7. Michigan law prevents us from going back before Labor Day. Teachers go back August 22 and students begin with a full day on Tuesday, September 6, 2016. The studenst start school on Sept 6 for a full day and we go in for a conference day the Thursday before. Would love to win this for my self-contained class. We start back on the 22nd of August! We start school September 1, but we have a meet and greet night August 30. We start back August 15th. We start school sept 6. Thanks for the giveaway! Students return Monday, August 8th. Our students return to class September 6. Enjoy your first day back, everyone!! August 31, which is coming quickly! Our kids return to school on September 6th! Our students start on August 30th. Teachers return August 24th, students on September 6th. We begin this year’s adventure on August 23, 2016. Can’t wait! Students return to school on August 23rd. Our students start school on August 24. August 31st…..Can’t believe it is just around the corner!! Our students start September 8th. My preschoolers start on September 6. Students start August 23rd! 16th for teachers! My students come back Thursday August 11th. Exeter Unified!! My theme this year is puppies!!! Our students return August 19th. We have Meet the Teacher Night on August 18th. I am so excited to meet my new kindergarten kiddos. Our school begins on August 15, but our kindergartners start August 22. Students will be returning September 6th . Our preschool official starts the school year in August 29th. First day of school is August 17, 2016. Our first day is September 6th! Our School Year is off and running – students returned Wednesday, Aug. 3 ? We have students on Monday, August 22 but Teachers work week starts the week before. Students first day is August 24th!!! Kids go back August 29. We are back for workdays the 22. We start classes on August 22. Our students return on August 22nd. School starts for teachers Aug. 11. Kiddos start on Friday August 12. We report the 8th of August with students on the 10th. Students start back on August 29. Our students return August 17th! Students’ first day is September 6. Kids start sept 6th, we start sept 1 st.
We started August 1st, and would love to win!!!! We start school on September 6th! We teachers head back on the 26th of August for Professional Workdays. My students start August 22! Students start on the 19th, teachers on the 15th. I will meet my new students September 6th! Our kiddos start Sept. 6th. Teachers start on August 18th, our students start on August 24th. August 22nd – T-Bone is adorable! We start school August 22!! We start September 6 – so not ready for summer to end!!! We start on September 6th? Teachers go back Monday and our students return on the 15th. Students start back on August 29! My students return August 23rd. Students start on August 29th. Our first student day is August 31st! My students in the Bronx return on September 8th. Teachers go back on August 16th and students the 22nd. September 1st is the first day of classes. We start on September 13th and it will be a full day. Our students start school on August 16th! Students start Aug 17th and Teachers on the 15th. ? Our first day is September 6. Sept. 6th. And my homeschooling for one child will begin also begin. My school starts September 7, but my kids’ school starts August 31. Students start on August 17th and Teachers on August 15th. Our students begin on Tuesday ,August 16! Students’ first day is Seotember 6. Teachers report August 29. ? We are already on day 5 of school. Our students return August 15th, but teachers start on August 8th. Students come back August 24th, and I can’t wait! August 22… And I love T-Bone. He would go great with my paw print classroom theme. Our students start September 8th! We started back on August 1st, and the kids start the 8th. You all are all making me sad. We start back August 10th. They come back August 16th. Tuesday, September 6th. Can’t wait! Teachers start the 10th, students the 17th! First day for teachers is Sept 6, first day for students is Sept 8! September 6th for students which is a half day and September 1st for teachers. Our students return on August 22– a new adventure for all! Our students start September 6th! Our students return August 17th. We start back on the 24th. But meet the teacher night is the Friday before. Our students start on August 29th!!! Our students go start August 22. New student orientation is Sept 7. The rest start on Sept 8. Students come back on Sept. 6th! Students start August 29th. ?? Students start back Sept. 6. While teachers go back Aug. 22. Students star back on August 29. Students start Thursday, August 25th. We begin school on Monday, August 15. It will be a full day! Staff returns August 31, but students don’t return until September 6. School starts August 15th. ? We start on Wednesday, September 18th with a Pre-K Open House! We start after Memorial Day. Wahoo! District students start 8/16, although we in pre-k have open house that day-our students start the next day. We teachers start back Monday for inservices and the students report next Friday, August 12. We have a split start day with odd grades starting the 15th and even starting the 16th. We start back on August 31st! We start school on August 17! Students return August 22nd. Teachers go back August 10th. We start school Sept 6th here!!! My boys LOVE T-bone from Clifford!!!! Fingers crossed for my boys and good luck to everyone!! We start back August 16. We start school Aug 24th. My students return August 10th? Our students begin August 29th. It’s going to be a fantastic school year! Kids come back September 6th, looking forward to it. Kids start Sept 6th…. A month from tomorrow! Really feeling bad for those who start soon or have already started! Our students first day is August 22. We begin school next Wednesday, August 10th. The students will join us the following week on Wednesday, August 17th. I can’t wait, because I miss my kiddos!! We start back September 6th. My kids will begin on August 29. Ready for a new school year! Students start on Friday, August 19th! Students start August 29th. ? The kids first day,is August 18th. My kindergarteners start on August 24. School begins August 17, Crazy early I know ? Students start Wednesday, August 10th and teachers started Tuesday the 2nd! The kids return on August 29th. I’m not ready!! We return on August 22. Our students return August 25. Students are back on August 31st but in kindergarten we use the first three days for parent conferences. Kindergarten students will start September 6th. Friday, August 19th for all grades but 6th and 9th start on Thursday 18th. Our students start on August 29! August 22, but us teachers August 8th…. My K4 students start on August 24th, everyone else on August 16th..
We’ll be starting on August 22nd! I am blessed to be at a wonderful school! Our first day of school is September 1st. August 28th! Excited to meet my new students! August 24th the kids are back! Our first day with students is September 1st. Students return on September 6th. We start school on Tuesday, September 6, 2016! We start back on August 10 ? We started August 3rd. Yay for today being Friday! September 6th is our first day of school with the students. At our school 1st-8th start 8/29, kinder starts 8/31 and preschool and pre-k starts 9/6. Lower Township Elementary starts school on September 6th! Have a great school year everyone!!!!! Students return to school August 18th. Our students return on Aug. 22! Students return to school on Monday, August 22. Our students start school on August 30th. Excited to see all the new little kindergarteners!!!! Our students start back on September 7th. PD day on the 6th. Kids are back on Wednesday, August 18th! Parent/teacher conferences Sept. 6 & 7–First day for kinders on Thursday, Sept. 8th. Our children come to school on August 15th in Charleston, AR. Our first day of school is August 29th!